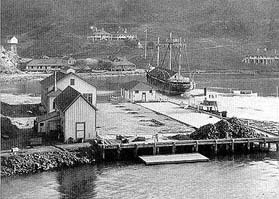 In 1892, a Quarantine Station was opened at Ayala Cove (then known as Hospital Cove), where ships from foreign ports could be fumigated, and immigrants suspected of carrying diseases could be kept in isolation. The warship USS Omaha was borrowed from the Navy in 1893 and its boilers used to supply superheated steam for fumigation. The 40 buildings at Ayal a Cove included a 400-bed detention barracks, a disinfecting plant, laboratories, and quarters for employees. As the years passed, use of the Quarantine Station diminished. Better medical examinations were made at ports of embarkation, and improved medical practices made lengthy quarantines unnecessary. Being an island isolated from the mainland made the station inconvenient and expensive to maintain. It was abandoned when the U.S. Public Health Service, who succeeded the old U.S. Marine Health Service, moved its headquarters to San Francisco. Most of the old quarantine buildings were torn down in the late 1950s, after Ayala Cove area became a state park. The remaining structures include the former bachelor officers quarters (now a visitor center & museum) and several employee residences which are now used by state park personnel.